This quote was passed on to me by a couple of different people. It’s found in several books, including Meditations for Pain Recovery, Meditation and Qigong Mastery, and The Law of Attraction. 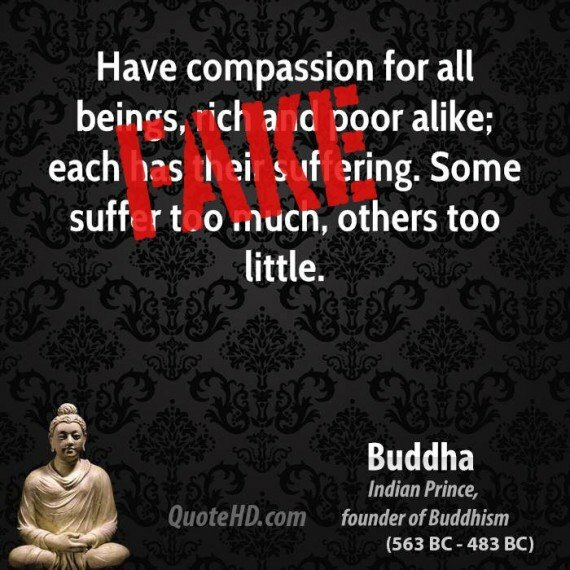 Apparently fake spirituality attracts Fake Buddha Quotes. Have compassion for all beings, rich and poor alike; each has their sufferings. Some suffer too much, others too little. It’s also on many websites. It’s not surprising it’s on quotes sites like ThinkExist, since they seem to do no fact-checking at all. But with sites like Buddhist Belief Blog you’d hope for better. It is of course patently fake. There’s nothing at all unusual about the Buddha encouraging us to have compassion for all beings. But I don’t think he would ever have suggested that some people need to experience more suffering. The earliest of the books mentioned above is from 2009, so this is almost certainly a new Fake Buddha Quote. It’s hard to search the web by date, but Leo Babauta on Zen Habits uses the quote on a post dated August 14, 2008. Someone called Arvind used the quote a little earlier, on January 5th of 2008. Those are among the earliest blog posts I’ve found using the quote. A forum post dated April 8, 2006 takes us back a little further, but contains no source. That’s the earliest reference to the quote that I’ve found on the web, apart from a deleted post from March 19, 2006, on a now-defunct site at bighappybuddha.blogspot.com. A forum post dated August 23, 2007 mentions having lifted the quote from a site called BrainyQuote (one of those quotes sites littered with misattributed quotations). Alas, where BrainyQuote got the saying from, or whether it predates the 2006 examples, I just don’t know. So the origins of this quote are a mystery, although its fakeness is clear. But here some woman or man is not obdurate or haughty; he pays homage to whom he should pay homage, rises up for whom he should rise up, gives a seat to whom he should give a seat, makes way for whom he should make way, worships him who should be worshipped, respects him who should be respected, reveres him who should be revered, honors him who should be honored. Due to having performed and completed such kammas, on the dissolution of the body, after death, he reappears in a happy destination… If instead he comes to the human state, he is high-born wherever he is reborn. This is the way that leads to high birth, that is to say, not to be obdurate or haughty, to pay homage to whom he should pay homage, to rise up for…, to give a seat to…, to make way for…, to worship… respect… revere… honor him who should be honored. This is often taken as the Buddha saying that people who are rich in this life must have acted well in a past life and that people who are poor in this life must have acted unskillfully in a past life. But it seems to me that all the Buddha is saying is that acting badly leads to poverty, ugliness, illness, etc., but not that all poverty, ugliness, illness, etc. are inevitably the result of previous karma. This is a very important distinction to observe, otherwise we’ll tend to blame the poor and the sick for misfortunes that may be nothing at all to do with their own actions. “But I don’t think he would ever have suggested that some people need to experience more suffering.” I disagree with that. Some people have a lack of suffering caused by overmotivation. The Buddha would likely have felt that while he was a prince. I could definitely see that this may not be a Buddha quote. But I do think it would be something he would say. Can you supply one thing the Buddha said that indicated that he thought some people should suffer more?